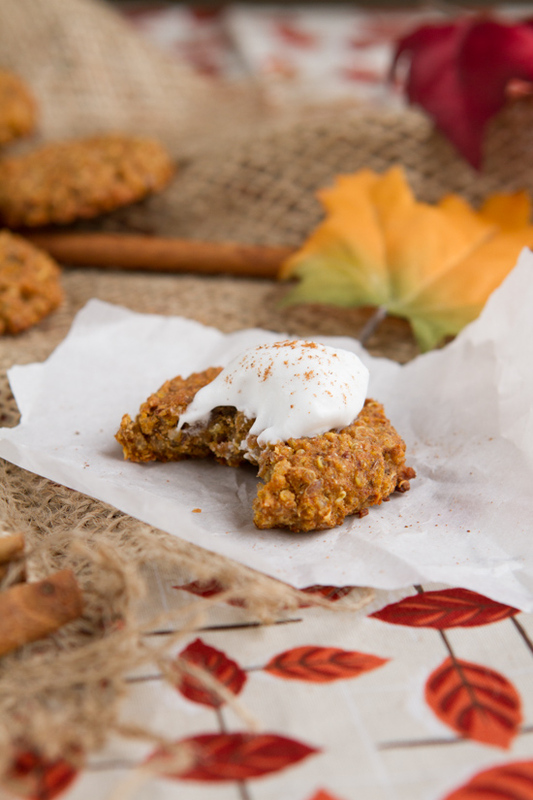 These good-for-you cookies made with quinoa and pumpkin spice are the perfect Fall treat, whether you have them for breakfast, snack or a post workout bite! Add quinoa to a fine mesh stainer and rinse well before using in this recipe. Add water and quinoa to a saucepan. Cover and bring to a boil. Reduce heat to low, and simmer for 15 minutes. Once complete, remove from the stove, remove lid and allow to cool for a couple of minutes. Meanwhile, preheat oven to 350F and line a baking sheet with parchment paper or a silicon baking mat. Set aside. Add flour, sugar, ground flax, pumpkin spice mix and salt to a large bowl. Then, measure 1½ cups of the cooked quinoa and add to the dry ingredients. Stir to coat, until all quinoa granules are covered in the mixture. Set aside. Add pumpkin, oil, vanilla, egg white and maple syrup to a small bowl and stir well. Pour the wet mixture in with the dry mixture and stir to combine. Bake in the preheated oven for 25-30 minutes, until cooked through and golden. Remove from the oven, let cool on the pan for 10 minutes before transferring to a cooling rack and allowing them to cool for a couple of hours. Because cooked quinoa was used in this recipe, the longer you leave it to cool, the firmer your cookies will become. Leave them be and they will transform! When ready to serve, top each with a teaspoon of whipped cream if desired. Cookies can be stored in the fridge for up to 2 weeks. To make these quinoa cookies gluten-free, use gluten-free all-purpose flour like this. Coconut sugar could likely be replaced with any other type of sugar that you have on hand. Grape seed oil works well for this recipe, but any oil will do the trick! 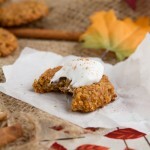 To make these quinoa cookies dairy-free, you could use coconut cream for the topping instead of whipped cream.